The BHS High Value Cart Dropbox (HVC-DB) is a dependable steel container for sensitive materials and valuables. A durable powder-coat finish prevents rust and corrosion, making these units ideal for outdoor use or in industrial applications. The narrow drop window is designed to admit items and keep out unauthorized hands. Rental car companies use these units to collect keys after hours; document destruction services use them to collect confidential paperwork for later retrieval. They can also be used to protect cash, jewelry, and other valuables at home or in the workplace. 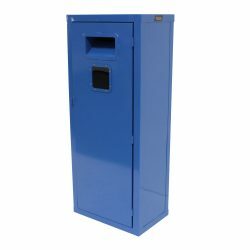 Like all BHS products, High Value Cart Dropboxes are constructed to withstand harsh environments, such as those found in some manufacturing and material handling operations. This rugged design ensures security for all valuable documents or items in every industry. If you need to control access to legally protected documents or high-price items, the High Value Dropbox from BHS is the right choice for the job. In addition to the floor-model HVC-DB, BHS can custom-design and manufacture a secure steel enclosure for any space or application. To discuss the options, or to find your nearest dealer of BHS products, call 1.800.BHS.9500.